If you’re like me then you are probably having some folks over in the next three or four weeks. It may be some good friends stopping by, it may be some family staying for a while, it may be a big party that you’re hosting. Whatever the occasion, it’s always great to make a lasting impression as a host. That can be tough to do, with the stresses that come about with guests (my kids always seem to trash the place the day before we have party). I therefore like to find ways to make my parties stand out from the rest without having to put in massive amounts of work. One way to do this is in the beverage department. Most parties in December will have egg nog based drinks. These are great and I do love seasonal drinks, but it’s fun to mix it up and give your guests something fun that they wouldn’t expect. 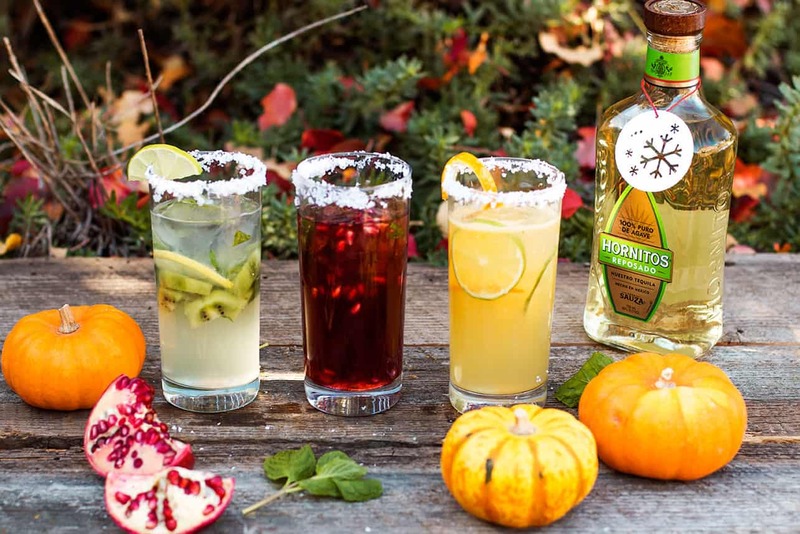 For my next party I am going to make the following three tequila-based drinks: Pomegranate Margarita, Orange Margarita and Kiwi Lime Margarita. They are very easy to whip together, and I recommend making and serving all three at the same party. It gives your guests a few delicious options but also gives some “wow factor” in the presentation. The colors alone of the three look great and will be one more thing to make your party stand out. We’re all tempted to constantly clean up during a party but feel free to leave some of the peals and pieces of fruit in front of the bottles, they add a nice touch. I highly recommend using 100% Agave Tequila, and Hornitos is my go-to brand as it has a smooth taste that also mixes extremely well. Most people think of a standard margarita when they hear tequila but there are so many delicious and colorful varieties out there. 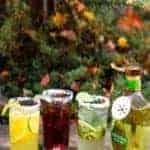 I personally use these recipes as much as any other for tequila drinks, the taste is phenomenal and I the color of the drinks are eye-catching and adds a little pizazz to the party. 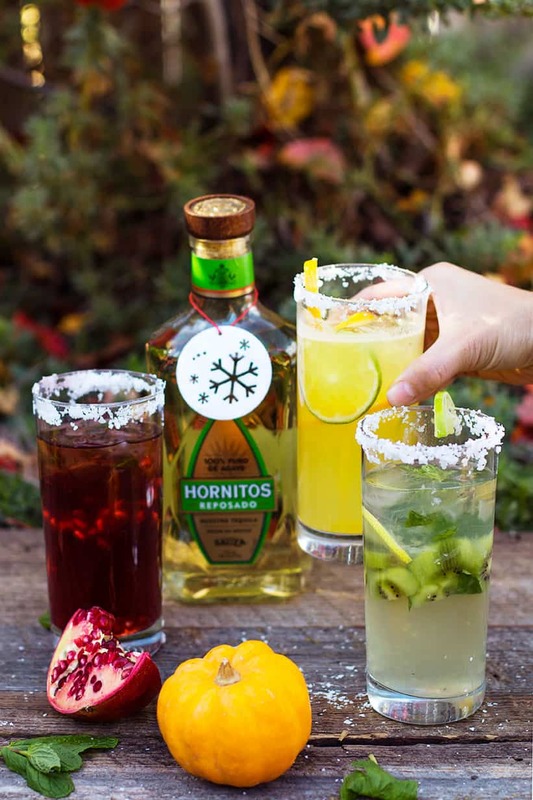 This holiday season I recommend you keep your party going with these three margarita recipes made with real fruit and Hornitos Tequila. They are stylish yet easy to make and will likely be a hit with you and your guests. Those are all perfect for any Christmas party this year. They all sound delicious. I love a good margarita and I was just doing a photo shoot today of my signature margarita that will be coming out Friday. I need to add these to my list of faves. Yum! Oh yum!! Those all look so good! Can I just stop by your place and drink a few! I see a girls night with these! Those looks so delicious. Fruity drinks are my absolute fave. They’re yummy. Oh yum! Great ideas. I could go for one of those pomegranate ones. I’ve never made one with pomegranate before! I love the look of the fresh fruit in the glasses. The presentation is everything, and you’ve made it look great! I don’t drink, but your photos are very inviting to look at. Makes me want a nice fruity drink. That pomegranate marg is calling my name. Looks so good. Thanks for sharing. Oh those all look AMAZING and tequila is kind of my jam. I really love the photos. And i think it would be perfect for Christmas eve. I really love these mixes, it would be perfect for Christmas or New Year! All so lovely! These look so festive! I know I’d love to try the pomegranate margarita most! The color is fabulous! Might just be the perfect signature drink for our New Year’s get-together! The Margaritas look yummy and refreshing. I rarely drink alcohol anymore, but I would love to try these drinks. Everything looks great. These drinks would be a sure hit at any party. I have never tried making margarita and these all looks awesome. Love the fruits you’ve used! I would love to try these drinks. They look so refreshing! I bet my hubby would love it too! Not much of a drinker me – so really appreciate the recipe so that I can make for holiday guests. I have never regarded tequila as a winter holiday beverage. This is a very interesting collection of celebratory concoctions. I love a good margarita. These flavors look and sound amazing. I will definitely be trying these soon! These will be great drinks to make for my Holiday party. I will have to make some and give them a try. YES for all these fab margarita recipes!! They look super yummy!! 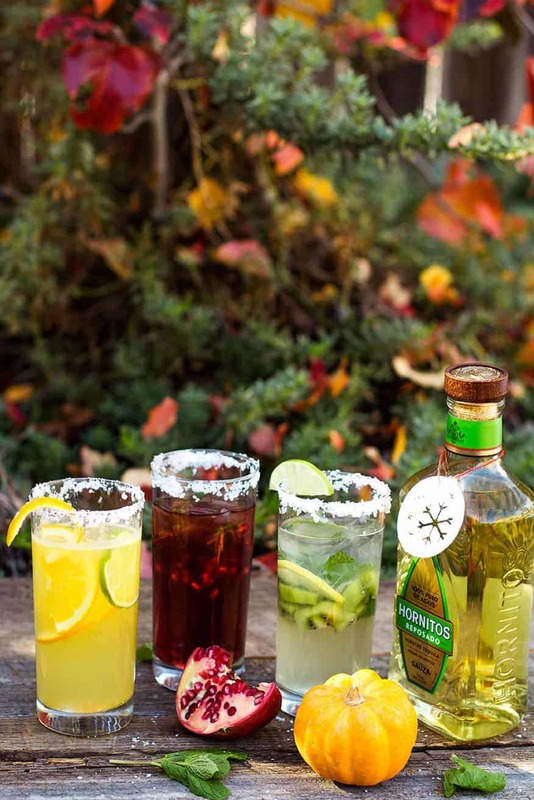 Margarita recipes would be perfect this coming Christmas. I love this idea thank you. Those drink recipes look delicious! I have not had Agave Tequila in years, but I do remember how good it is. There was just something about it compared to other Tequila brands, that made this one so much better. These look really good! I would love to serve these at my holiday party. I know my mom would love them! oh, my goodness! I would love a glass of each…looks really good! Yum! I typically don’t like flavored drinks – like chocolate martinis and peach daiquiris – but margaritas are an exception. I think it’s because they are typically still citrusy and not cloyingly sweet. These sound wonderful! Yum! I don’t even know which one to try first. I haven’t had a margarita in a long time but these look too good to pass up. I do like the presentation wow factor.And you’re right, they do look great. All of those look so good. I love to have a margarita every once in awhile. I’ll have to try out these. The kiwi lime one is the one I’d probably really enjoy. This would be absolutely perfect for a holiday get together! Love Margaritas! Those all look good, but the pomegranate one is so beautiful and festive. I’m sure it tastes divine! Yes, Yes, and Yes!!! I will take all of them, please!! Margaritas are always perfect for parties and get-togethers. We always have strawberry and mango here; pomegranate and orange margaritas are something that I would love to try next time. I love your photos, the fruit looks amazing! I am not a huge margarita fan though! Wow, those all look so pretty and tasty. I don’t drink much but I would love to enjoy one of those this holiday. These drinks are amazing! I will have to give them a pin! Love your pictures! I was sitting on Pinterest earlier looking for ideas. Thanks so much, I’m so trying these for our Christmas party. Omg now this is my kind of post! Margaritas are the absolute best. This is a good refreshment and its easy to make as well. Just about right if some family and friends come over for a night with a fun conversation. I seldom drink alcoholic-based beverages, but I do love to have a margarita once in a blue moon. I love these recipes! I love your photos. These sound like great entertaining drinks. Thank you for the recipes! These are almost too pretty to drink! I wonder if I could make them virgin since I dont really love alcohol. lol. All those beverages look amazing! I can’t decide on which one I like best! Love your pictures too! I haven’t had a margarita in a really long time. All three of these options look refreshing. I’ve never seen a margarita drink with fresh kiwi in it – that looks tasty. The pomegranate looks like the yummiest! Wow! These looks so yummy! Great pics! Any of these would make a great cocktail for parties. They look so festive! You have made my day posting this. I won’t have company over for the holidays this year but my spouse and I love to drink together. I am always looking for new things to try or create. Thank you so much for sharing this I will definitely give this a try.